US Ambassador to Bangladesh Earl R Miller on Tuesday assured Bangladesh of continuing his country’s support to address the losses Bangladesh incurred on the environmental front due to the presence of huge Rohingyas in the coastal district. 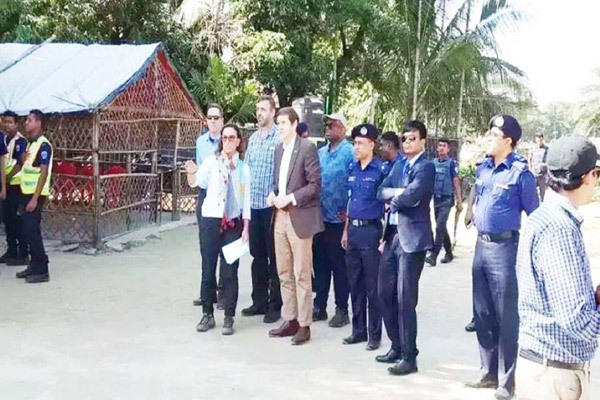 “US position is that we want a repatriation process that’s safe, dignified and voluntary.....that remains our position,” Ambassador Miller told reporters after visiting Rohingya camp in Balukhali area of Ukhia upazila. Ambassador Miller also talked to Rohingyas and officials of the International Organization for Migration (IOM). The United States has remained committed to helping the Rohingyas and commended the government and the people of Bangladesh, who have responded swiftly and generously to the Rohingyas arriving in Bangladesh, on several occasions. This additional funding brings US humanitarian assistance in response to the Rohingya crisis to nearly $389 million since the outbreak of violence in Myanmar in August 2017. According to the US Embassy in Dhaka, the new funding includes $156 million for Rohingyas and host communities in Bangladesh to support the implementation of critical emergency services, including protection, emergency shelter, food, water, sanitation, healthcare, and psychosocial support. Since August 2017, more than 725,000 Rohingyas have fled violence in Myanmar’s Rakhine State, crossing the border into Bangladesh. Bangladesh now hosts over one million Rohingyas. Miller was confirmed as US Ambassador to Bangladesh by the US Senate on October 11.